BANGI, 19 Nov. 2010 – Seventeen heads of cattle were slaughtered at the Universiti Kebangsaan Malaysia (UKM) Islamic Centre here in conjunction with Aidiladha celebrations yesterday. 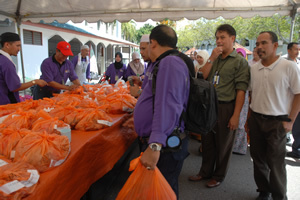 Islamic Affairs Officer, Khairil Khuzairi Omar said 137 staff of UKM from various faculties and sections were involved in making the event a success. The slaughtering, cleansing and distribution of beef went on smoothly with the formation of nine sub committees under the chairmanship of UKM’s Bursar Haji Mohd Abdul Rashid Mohd Fadzil. 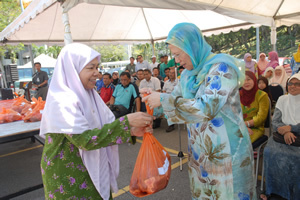 Vice Chancellor, Prof Tan Sri Dato’ Dr. Sharifah Hapsah Syed Hasan Shahabudin was on hand to help distribute some of the beef to those eligible. 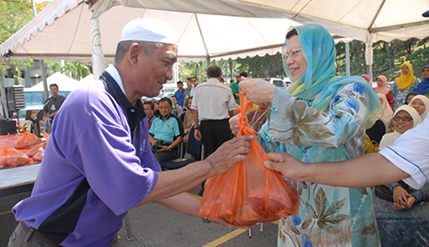 The Selangor State Government through the Hulu Langat Religious District Office contributed a cattle while beef from one of the slaughtered herd was later sent to victims of the recent floods in Changloon, Kedah. Those present were later feted to a lucheon with some of slaughtered beef.